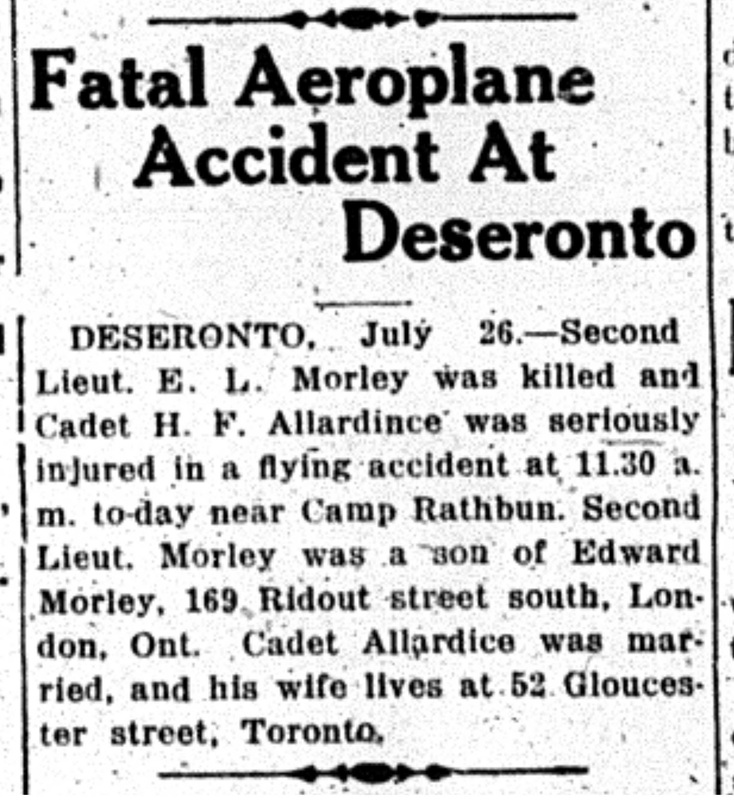 Harry Frank Allardice died in Deseronto at 9pm on this day in 1918 as a result of the same accident which killed Lieutenant Edward Lionel Morley. Allardice had suffered a fractured skull in the crash and died 34 hours later, according to his death registration. DESERONTO, July 26.- Second Lieut. E. L. Morley was killed and Cadet H. F. Allardince was seriously injured in a flying accident at 11.30 a.m. to-day near Camp Rathbun. Second Lieut. Morley was a son of Edward Morley, 169 Ridout street south, London, Ont. Cadet Allardice was married, and his wife lives at 52 Gloucester street, Toronto. Allardice was born in Fulham, London, England on May 24th, 1888, the son of Joseph Allardice and Emily (née Foster). He came to Canada on the SS Lake Champlain on June 30th, 1907, heading for Wadena, Saskatchewan. He worked as a superintendent for the Barnett McQueen Company in Fort William (Thunder Bay) from 1908 to 1912. He married Hilda Powell Chipman in Port Arthur on December 30th, 1912 and the couple then moved to Ottawa, where Allardice worked as manager of the Silicate Brick Company. They had two sons, Francis Joseph who died at the age of two in 1916 of a fractured skull and Donald Clair, who was born on May 3rd, 1917. Harry signed up on January 3rd, 1918 in Toronto, with the regimental number 153797. He was five feet eight and a half inches tall. He gave his home address as 216 Waverly Street, Ottawa. The accident which killed him was his first flight with 82 Canadian Training Squadron. Allardice was buried in Beechwood Cemetery, Ottawa, in the same plot as his son.